Blowback ’63 is a unique blend of historical fiction, romance, and time travel filled with convincing conflict and compelling young adult characters. Brian Meehl’s Blowback ’63 continues the adventures of fraternal twins Arky and Iris Jongler-Jinks, who are as busy with high school as they are navigating the sudden disruptions in the time stream caused by their dangerous heritage. The twins have discovered that Iris’s talent at playing the family’s English horn can send a person through time, but when they start experimenting, it’s unclear who’s playing whom. The horn’s music sweeps two new unintended travelers back in time. Returning requires finding the historical Jongler whose own horn can send them back. Having accidentally sent themselves into the past only a few months before, Arky and Iris are still uncertain how time travel works. Caught between cover-ups and denial, they’re reeling from recent events and the discovery that their mother’s disappearance more than a year ago is actually the result of her experiments with the horn. At odds about how to get her home, the siblings are at each other’s throats as usual. But it soon becomes clear that the horn has plans of its own. When Arky’s friend Danny knocks out a batter the day he’s being scouted as a pitcher, a school baseball game spins out of control. Tempers flare just as Iris is practicing an audition piece on the horn. Suddenly, Danny and Arky are transported to the Battle of Chancellorsville and conscripted into the Union Army. But while Arky is running messages and finding clues about his mother, Danny must face his fear. He discovers that both sides of the fractured nation have baseball fever, and he’s going to be the latest addition to his unit’s baseball team. What’s always exciting about Meehl’s series is its deft union of character arcs with historical details. In this book, Danny’s story closely parallels Matt Grinnell’s story in the first book. He participates in the origin of a beloved sport, awakens to romance, confronts unresolved issues, learns the power and risk of making decisions, and takes nascent steps toward his own identity formation. Arky is another matter. This story reveals him in new ways, none of them good. Whether with a friend or alone, Arky is always temperamental and conflict-prone. He’s smart and able, but he’d rather run than take a risk, and his stubborn ugliness suggests that his adventure might not be over when Danny’s is. With Arky and Danny actively time traveling, the twins’ mother lost in the past, and Matt still on Iris’s hands in the present, Blowback ’63 is sprawling. There’s a lot of ground to cover, and the book bounces around in its effort to tell each character’s story contemporaneously. While it’s interesting to consider the cumulative complications of the Jongler-Jinks’ adventures, this story also sets up the action for the series’ conclusion. The result is a lot of plot for one book to carry. While often exciting, there’s also unevenness. Some characters’ stories are explored more fully than others. 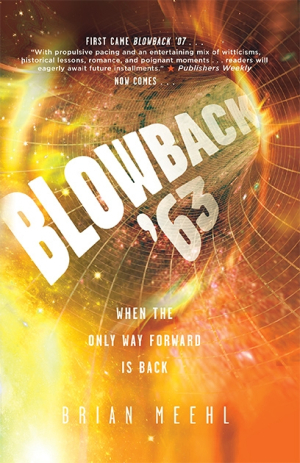 Blowback ’63 is a unique blend of historical fiction, romance, and time travel filled with convincing conflict and compelling young-adult characters. History is recast as these time travelers are forced to confront themselves, and the best beats of the series are repeated, while interesting new problems are revealed.